OK, a strange combination going on there, isn't it! Hello again, yes, a long long gap between posts, I know, and I'm not even going to try and explain why, and I can't promise it won't happen again! I have to say Jim and I really enjoyed them (recipe on Shaheen's blog) and they were so easy to make. Yes, it looks slimey in the bowl, but really, it is just processed seaweed, tasting of nothing but the sea! Thank you so much Shaheen, sorry this post is so late - and you STILL have not sent me your address so I can thank you properly!!! Blogland is such a kind, generous place, sometimes, isn't it? Apart from cooking, I have actually got some textile stuff to talk about this time! I've been invited to take a stand at the brand new series of craft fairs known as the Fakenham Makers Markets. The first one is this Saturday at Fakenham Church, and it looks like a very well produced event, I know Debbie and Keith Osborn have put in a lot of hard work in making it all come together. Here are two cushions I've recently completed. 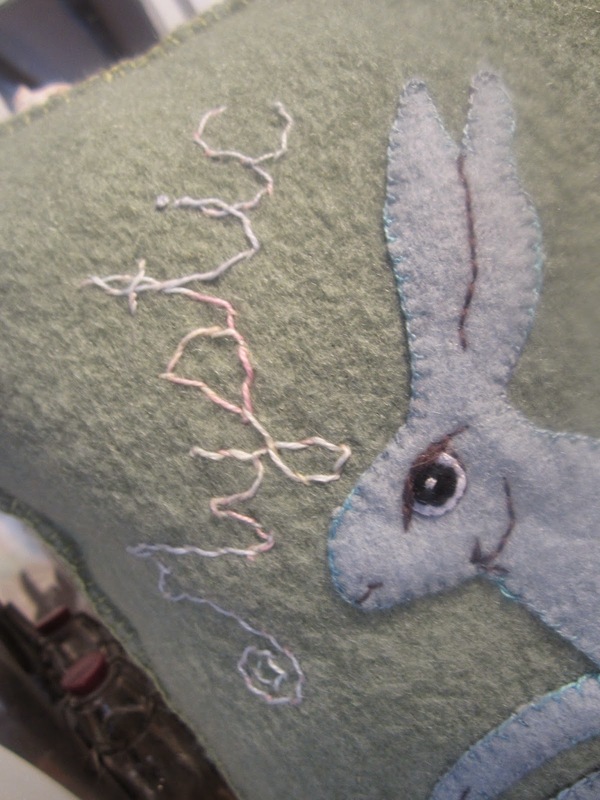 Both cushions are made by hand using hand-dyed woollen blanket and wool felt appliqué. They both have hand-made buttons on the back which enable removal of cushion covers for cleaning - DRY CLEANING only! So, wish me luck on the day, there is a Farmers' Market taking place at the same time so a good reason to come along! Other things occupying my mind have been LOTS of music, there seems to be a plethora of folk clubs and acoustic sessions happening within about a fifty mile radius now, we are quite spoilt! Can't have too much music, can you? Until next time, I shall now get back into catching up with my favourite bloggers, who, I'm afraid, I have sadly neglected; when I'm off-bloggin' I'm RIGHT off bloggin'! See you soon! Thanks for the Fakenham Craft mention, might try and get there, if not this one, then another. Be great to see you Dc, I haven't signed up to any others yet, but quite likely that I will later in the year. Your stitches are amazing and your cushions are enchanting. I know that you will do great at the festival. As for not posting regularly . . . I always feel that when you are not posting it is because you are out having fun and enjoying life. You are probably getting all geared up for spring and summer festivals. You can not imagine how happy it makes me when I visit your blog and see you in your amazing hat playing music with your friends. I wish that I could be a fly sitting on the brim of that hat and tagging along on your festive adventures. Have fun at all of your folk clubs, acoustic sessions and festivals and just post when you can . . . we'll all be here when you do. Hi Sue - that seaweedy stuff was actually rather nice but I do accept it looks less than appetising!! LOVE that cushion Lynne !!!! I have been to one of your local craft markets (Castle Acre) there is some lovely stuff being made in this part of Norfolk. I am off to the stitching show tomorrow to get inspired! Tell us where your music is going to be - love to come along. Thanks Linda - it went to the lovely KAthy Black - more next post! Thank you for the warm and kind words. I am pleased you enjoyed the laverbread, it was my pleasure to send it with you. I have a tin in my kitchen to be used up too. Good to see you back again, I had been wondering how you were, thinking I ought to drop you a line to make sure all was well with you. Hope you did well yesterday?